Almost all of the water consumed in the Coastal Bend comes from reservoirs that form a regional water supply system. 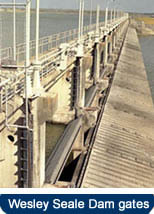 This surface water system consists of Lake Corpus Christi, Choke Canyon Reservoir, the Calallen Pool and Lake Texana. Water stored in Choke Canyon and Lake Corpus Christi is released as needed and flows down the Nueces River into the Calallen Pool, a shallow reservoir formed by the Calallen Saltwater Barrier Dam alongside Interstate 37. The San Patricio Municipal Water District Edwards Pump Station takes water from the pool and pumps it to District facilities between Gregory and Ingleside. Water from the Navidad River is stored in Lake Texana near Edna. It is carried to the Coastal Bend through the 64-inch Mary Rhodes Pipeline which runs from the Palmetto Bend Dam to Corpus Christi. In 2000 the San Patricio Municipal Water District completed a 36-inch and 42-inch pipeline which connects to the Mary Rhodes Pipeline south of Sinton and carries Lake Texana water to the District’s treatment complex. Water from the Nueces River and from Lake Texana is blended before treatment. 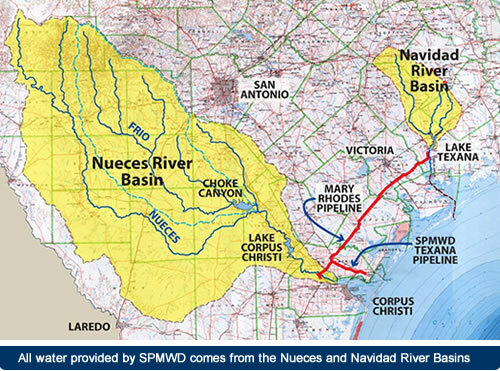 The three major reservoirs are operated in a managed system to maximize available water supplies and water quality while at the same time addressing the requirements for freshwater inflows into the Nueces Estuary and Lavaca Bay. Water pumped from the Nueces originates as rainfall runoff over the relatively arid watersheds of the Nueces, Atascosa and Frio Rivers. Water is stored in Choke Canyon Reservoir on the Frio River and in Lake Corpus Christi on the main stem of the Lower Nueces. Choke Canyon is a large reservoir completed in 1982 covering a surface area of 25,989 acres in Live Oak and McMullen Counties. It has a maximum elevation of 220.5 feet above sea level and can store up to 695,000 acre-feet of water. Water flows downstream from Choke Canyon into Lake Corpus Christi behind Wesley Seale Dam which was completed in 1958. It has a maximum elevation of 94 feet above sea level and can store up to 257,000 acre-feet of water, just 37% of the capacity of the larger, deeper lake upstream. The first dam at Lake Corpus Christi was built in 1929 with a maximum elevation of 74 feet above sea level. It failed a year later and was rebuilt in 1934. The Navidad River watershed upstream from Lake Texana experiences considerably higher rainfall rates than the Brush Country that covers the Nueces Basin. This means that Lake Texana is generally a very reliable source of high quality water for the San Patricio Municipal Water District.